10. Spam Museum, Austin, MN. 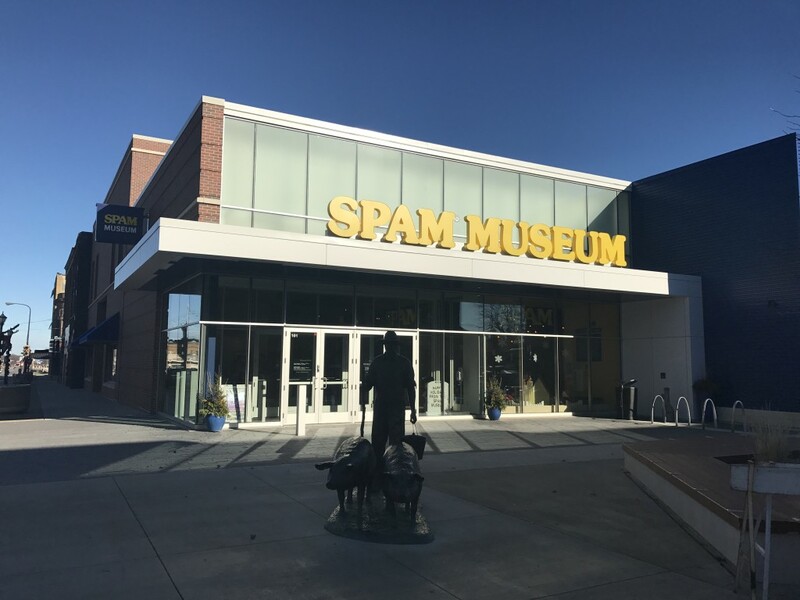 Much like Atlanta’s Coca-Cola Museum, the Spam Museum in the southern MN town of Austin is a mecca for enthusiasts of the product, bringing folks in from all around the world to have a look at its origins. Although many view Spam as a second-rate product best served on a camping trip or in the event of a zombie apocalypse, one has to admire how much this town has done with their hometown pride and joy. Don’t forget to pick up some merchandise on the way out! 9. 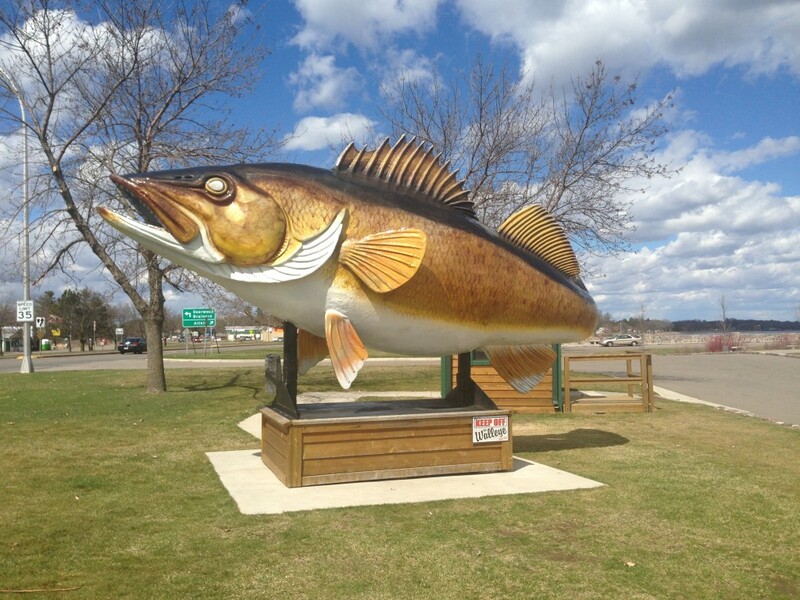 Giant Walleye in Garrison, MN. Yes, there are many large fish statues in MN. I think somewhere around 20 at last count. 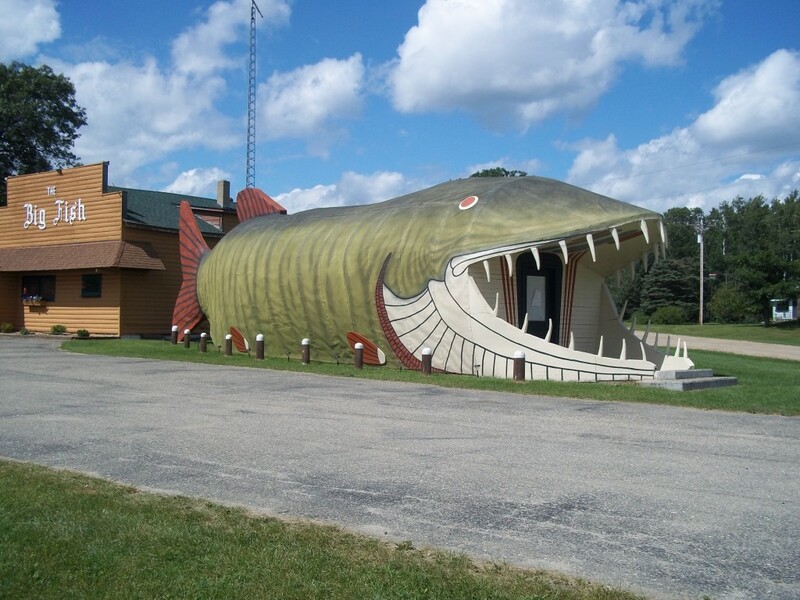 But this bad boy in Garrison, MN makes the top ten because of its proximity to Mille Lacs Lake, the self-proclaimed “Walleye Capital of MN,” and its color and attention to detail. Pull off Highway 169 for a great photo op and cast a line into the big lake behind the fish. 8. Jolly Green Giant Statue in Blue Earth, MN. 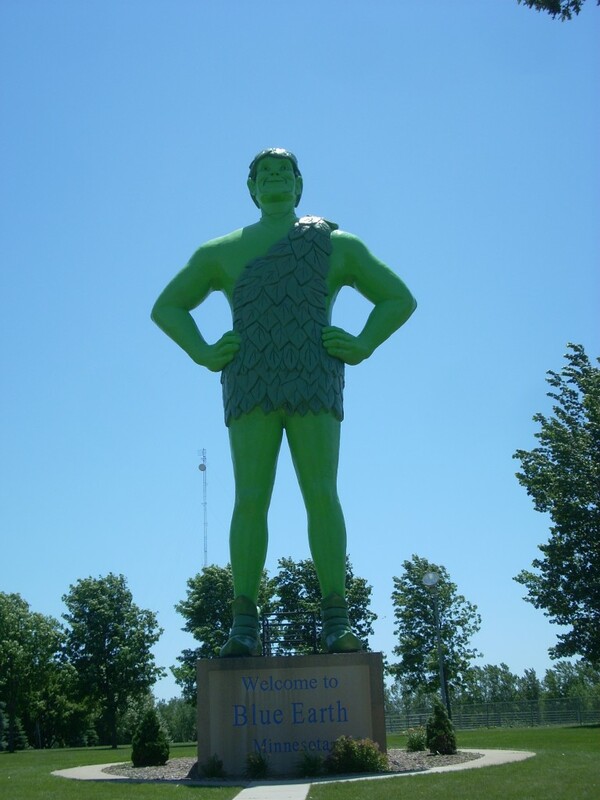 55 feet tall and smiling ear to ear, the Jolly Green Giant statue in Blue Earth is a no-brainer. 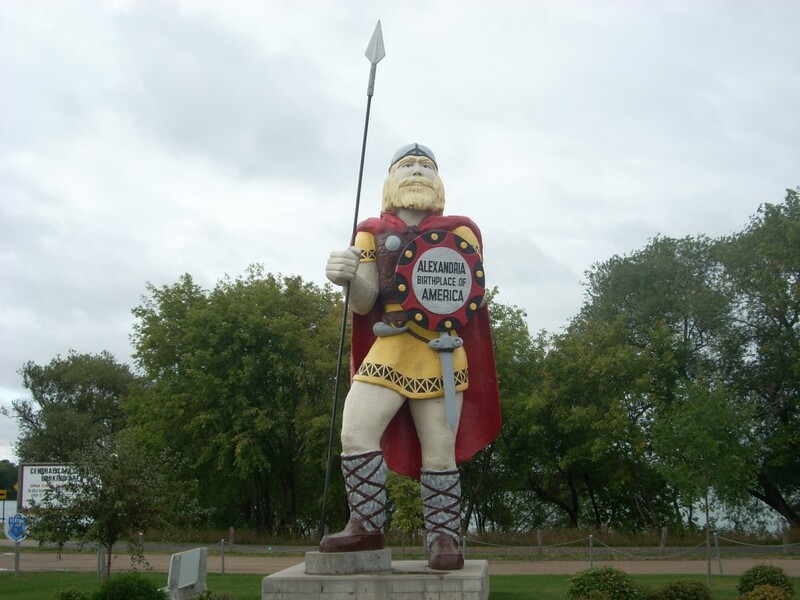 This happy, photogenic fellow stands on a platform begging tourists off I-90 to pose beneath him wondering why they didn’t make his tunic just a bit longer. Nearby is a small museum and gift shop. 7. 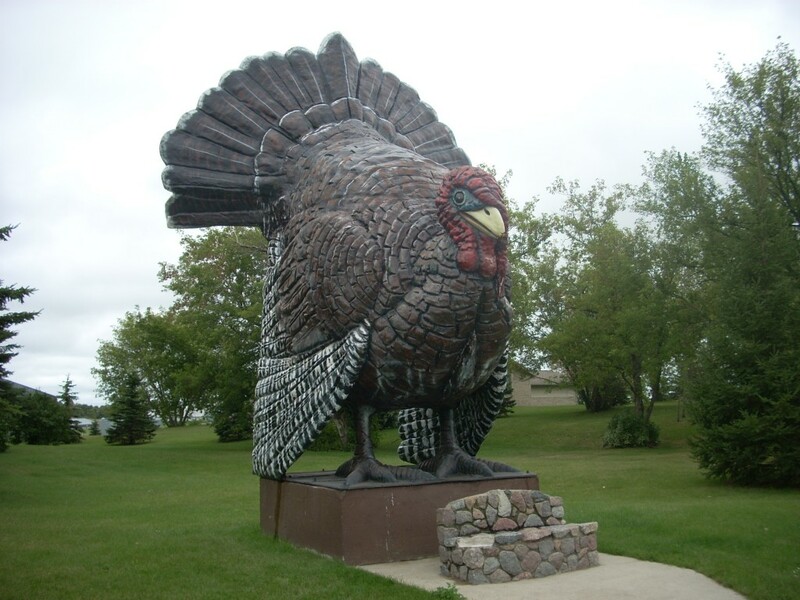 World’s Largest Turkey, Frazee, MN. There are also plenty of oversized bird statues in Minnesota, such as loons, eagles, a coot, a prairie chicken, and a crow. But this turkey, only a few miles from me, is a classic. 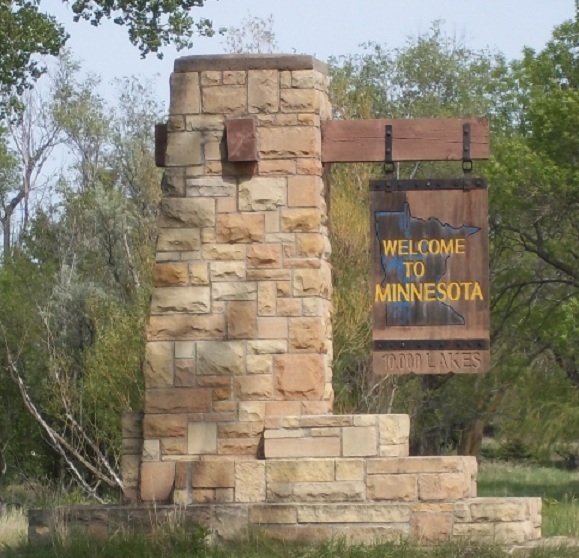 Frazee is known for its turkey farms, so in 1986 a statue was put up to bring in some more tourists off the highway. The original white-colored fiberglass bird accidentally went up in flames in 1998 and a new one was hauled in a year later, where it stands to this day next to a park on the Otter Tail River. Long Live Big Tom. 6. 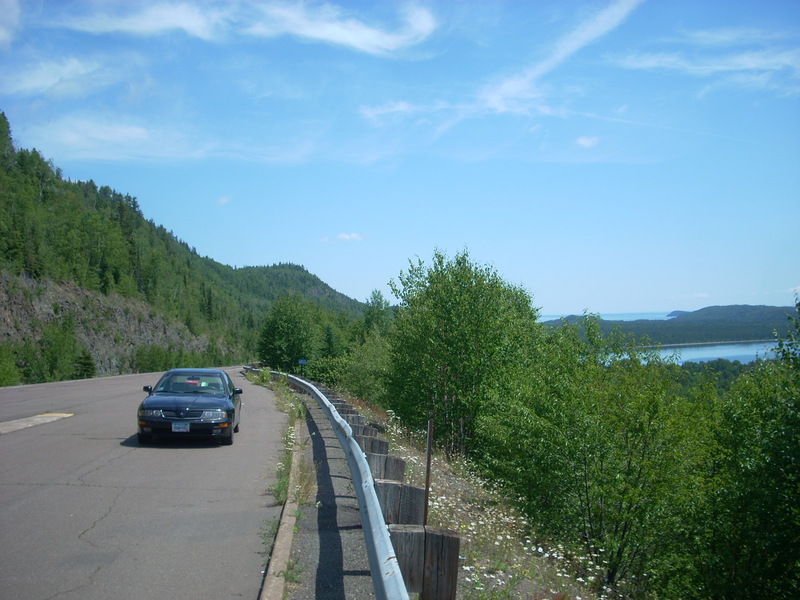 Rocky Taconite, Silver Bay, MN. 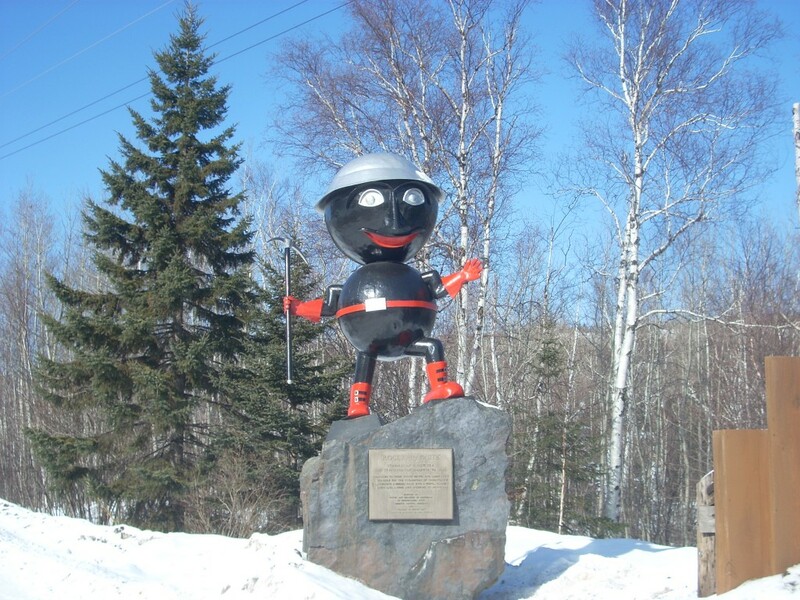 The unofficial mascot of the Iron Range, Rocky Taconite posts up on a piece of taconite on a hill overlooking Lake Superior on Highway 61. Minnesota’s North Shore is synonymous with recreation and beauty, but this happy-go-lucky fellow is a nod to the iron ore mining history around this area, marked by intense labor and destitution. He poses with his miners hat and gloves and pickaxe, and one can’t help but smile when passing by. 5. 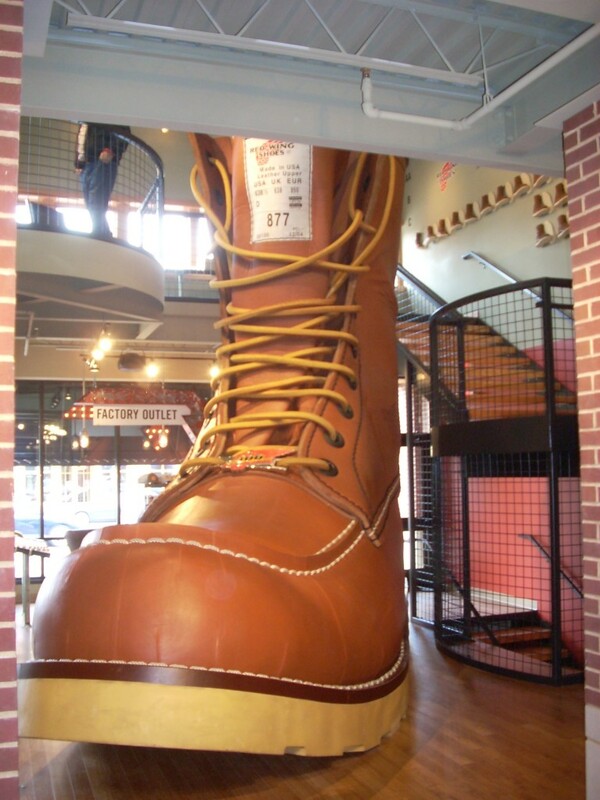 World’s Largest Boot, Red Wing, MN. A relatively recent addition to Minnesota’s roadside attraction landscape, this actual boot was made to the same specs as a regular Red Wing boot, only times about 600. The boot was built in 2007 and took just over a year complete. It’s16 feet tall, 20 feet long, and weighs over a ton. The Guinness Book of World Records even certified it. It’s housed in a Red Wing Shoes store in downtown Red Wing and occasionally makes it into the local town parade. 4. 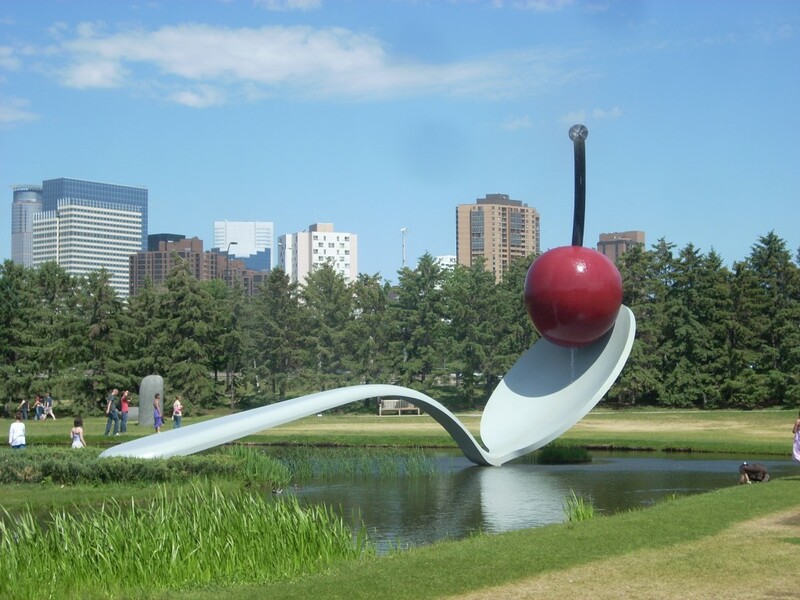 Spoonbridge & Cherry, Minneapolis, MN. This flawless work of public art sits adjacent to the downtown of Minnesota’s largest city, Minneapolis at the Walker Art Gallery and Sculpture Park. It was designed by Claes Oldenburg and Coosje van Bruggen, two architects whose work can be found all over the US. Completed in 1988, it spouts water off the top of the cherry into a small pond in summer months. It is arguably the Twin Cities’ most emblematic statue. 3. Big Fish Supper Club, Bena, MN. An obvious front-runner here at HighwayHighlights, the Big Fish in Bena even made it into the opening montage of National Lampoon’s Vacation. It recently was given a $10,000 makeover and looks fantastic. A great stop on a lonely stretch of Highway 2. 2.Big Ole, Alexandria, MN. For everything he stands for. For his shield that declares Alexandria the “Birthplace of America.” And because of his color, detail, location, and accessibility. This is one of the best. Just look at the damn thing. 1. 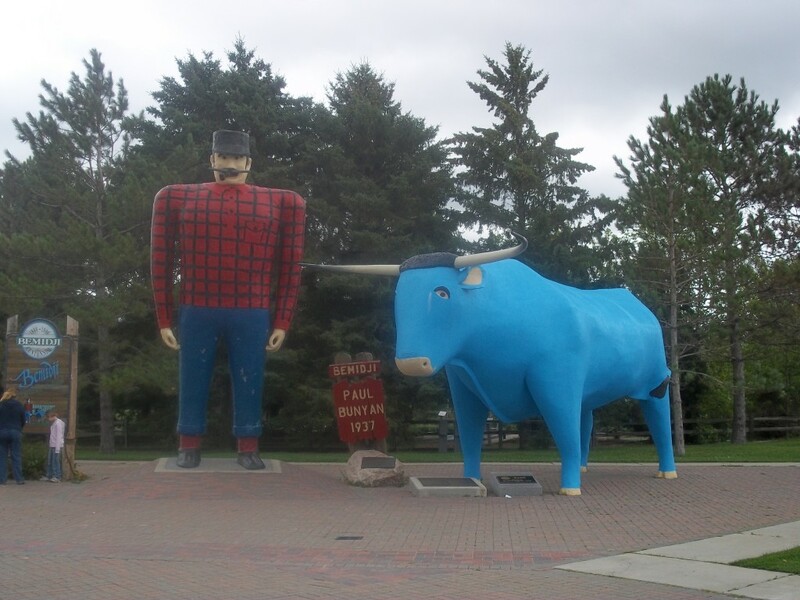 Paul Bunyan & Babe the Blue Ox, Bemidji, MN. It’s a coveted spot on the list, but Bemidji’s roadside classic edges out old favorites like the Paul Bunyans in Akeley and Brainerd, to claim the throne. These favorites have stood the test of time since 1939 and will clearly not be going anywhere anytime soon. Sure, there are plenty of bigger, fancier, prettier roadside attractions around our great state, but are any of them more iconic than these two? Honorable mentions: Paul Bunyan in Akeley, MN; Culvert Man of Nodine, MN; Twine Ball in Darwin, MN; World’s Largest Hockey Stick, Eveleth, MN. This entry was posted in Highway Highlights and tagged Big fish, Bird, Green Giant, HWY 2, Minneapolis, MN, Paul Bunyan, SPAM, Top 10, Viking by Seth5544. Bookmark the permalink.